Now that I'm done with vacation for a while, my tendinitis is completely gone. I would eye my arm suspiciously, but I'm just glad to be knitting again. We're leaving for Vermont in a week, so I figure I have about a week of viable knitting time before my tendinitis kicks in so I can't knit on another six-hour car trip. Anyway, since I knocked off about eight Momogus Knits samples, I thought I would treat myself to a knitting project that was not company-related. So I pulled out the Spring Garden shawl (the brown blobby thing). It's from the Spring Knitter's Magazine and it has beads in it. The beads are placed with a crochet hook, which was so much fun that it spurred me on through the rest of the (not really inspiring) pattern to get to the bead rows. Anyway, I picked it up, knit a few rows, saw that I had made a mistake a few rows back, and decided to abandon the whole thing. Then I gleefully cast on for a new Momogus Knits sample. Those are the two backs of two baby sweaters - the pink and the beginning of the blue. SO WEIRD. I'm sorry I have such uninspiring knitting to show you. The Fall Interweave Knits came and there is a cardigan knit in Felted Tweed that I would love to make, so someday (like when the temperature drops below 95 degrees) perhaps I will cast it on and wow you with my fancy-pants knitting. In the meantime, not so much. i think i'll be casting on for something out of vogue knitting before the interweave. once upon a time i was doing the lace shawl from fall 2004 vk..or 2005. it's spiders, webs and diamonds. even then i was starting my habit of not finishing awesome shawls, but gaining lace experience. i see vests in my future. sleeveless vests. ok, i'm gonna pretend that vests would have sleeves but not be called sweaters just so that statement can make sense. Yep, how about those Phillies? Oy veh, the 1st inning - that's just pitiful. Hope your body continues to be on the mend so that the road trips can be filled w/ knitting upon knitting upon knitting. Look forward to seeing your samples at the store!! jjp - good luck with those sleeveless vests! WA HA HA HA!! I too feel a vest coming on - there's an ancient one in Hip Knits that I have my eye on. 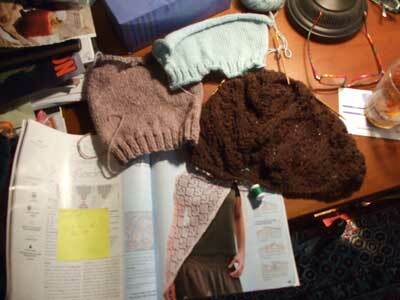 Considering how much I LOATHE knitting sleeves, it's surprising I've never made a vest. Let's have a race!! martha - good to hear from you - hope to see you in the store soon!! Hey, we got two new kittens!